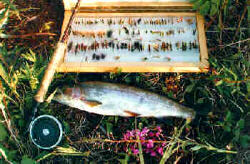 Open the Freshwater Fly Box and study essential patterns created for the world class fly fishing waters of BC. Each month, fly tier Philip Rowley shares some of his favourite fly recipes in Phil's Fly Box. Learn Stillwater Fly Patterns & Tactics from such master anglers as Brian Chan, Philip Rowley, Gordon Honey, Peter Caverhill, Fred Curtis and others. Fly fish for Salmon and Steelhead with Barry Thornton, your guide to Saltwater Fly Patterns, Saltwater Fly Tactics and River Fly Tactics. To learn more about the insects that these fly patterns represent, be sure to visis Fish BC's Entomology section! Study the insects that the flies represent.